Heroku Cedar Background Jobs for free! I’m using Heroku mostly for playing around with latest technology and hosting free apps. Since Heroku changed their pricing model due to the introduction of the new process model some of my apps changed from free to paid, especially those that had some background jobs or nightly crons (I really did not get, why this happend). If you want to run a resque worker and a clockwork process within your web-app, this becomes a costly thing, even if those are just running some minor jobs in the night, because you need to pay for 2 additional dynos. => Restarting app... done, v74. I created an example project running a Rails 3 application with a mounted Resque web, a Resque worker and a clock process with Clockwork. If you are just looking for a simple solution of running a background process have a look at crony, a bootstrap project using rufus-scheduler. Posted on 29. July 2011 25. 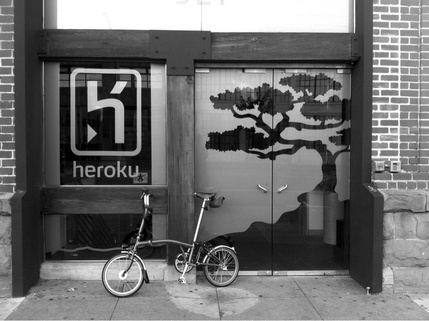 April 2014 Categories Heroku, Rails, RubyTags Cedar, Clockwork, Heroku, noSQL, Rails, Redis, Resque, Ruby9 Comments on Heroku Cedar Background Jobs for free! Before migrating to Bamboo, you should make sure your app runs on Ruby 1.9.2. If your app is not already deployed successfully to bamboo-mri-1.9.2, you should do that first, and then come back and try Cedar. Once you’re sure your app is fully compatible with Ruby 1.9.2, create an app on the Cedar stack and push to it. Currently, stack:migrate does not work for moving apps to Cedar. Since there seem to be no blogposts of how to do all the stuff with an existing application I will try to cover everything that I did to do the migration manually in this article. The docs for creating a Rails 3 app on Cedar reflect some of the changes that have been introduced with Cedar. # ones that you do not want to migrate! Looking at the result is quite disappointing, because nothing has changed for the user, but everything is new and shiny from the inside! If you have any other pointers of what you need to do for migrating your application please feel free to add a comment! There comes a time one has to create PDFs for a Rails application. Searching the web will most likely bring you to libraries like PDF Kit and Wicket PDF that use wkhtmltopdf as a driver. If your app is hosted on Heroku you wonder weather wkhtmltopdf is available so that you can use one of these awesome libraries. Searching the Heroku docs, you will probably come to same conclusion: nothing on there! You’re correct that there’s no official documentation. Most of our customers seem to be using wkhtmltopdf, generally with pdfkit. I do hope to document this usage soon. Of course, you can always purchase your own license and run it on EC2 or another server of your choosing. One of the libraries that were used at my last job was PrinceXML, which did a great jog generating PDFs from HTML pages. It supports most of the HTML and CSS stuff, passing the ACID2 test. PrinceXML has some additional CSS attributes that enable you to configure additional PDF specific layout settings. Since PrinceXML is a commercial product, Heroku won’t support it and I did not find anything on the web, that would offer PDF generation as a service. Asking the PrinceXML Forum I found out about DocRaptor. These guys provide a service to convert HTML to XLS or PDF over a webservice interface, extactly what I was looking for. As an additional bonus, they just implemented a gem for supporting the Heroku Add-on interface. Mail to Expected Behavior Support if you want to participate in the private beta. DocRaptor offers a great service, but they are still in early development. There were some Issues that were resolved recently. If you are a user of PrinceXML you probably know the —baseurl option that allows usage of relative paths for images and stylesheets. DocRaptor adds support for command line options just yet. The feature for generating a PDF from a given URL is even better! The latest DocRaptor documentation for the Heroku Add-on is decent and it provides some nice examples. send_data data, :type => 'application/pdf', :filename => "DocRaptor.pdf"
One caveat though, you got to have at least two dynos to serve the additional request from DocRaptor! See a working example on my homepage. Generating PDF form HTML without the hassle, thanks to DocRaptor!